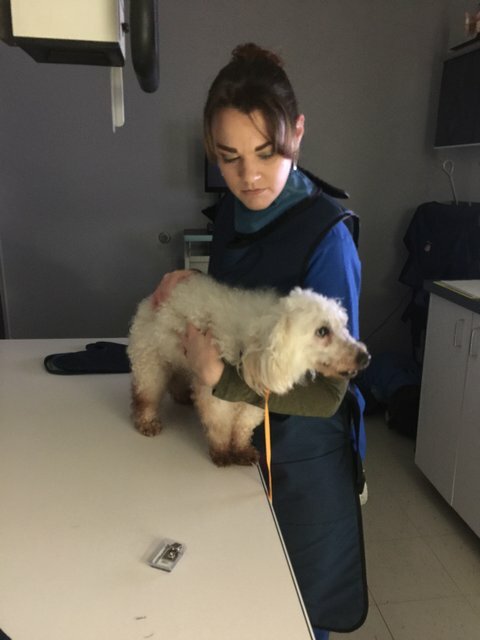 The Kylie and Cricket Memorial Fund has helped another local Frederick homeless animal... who is now available for adoption!! 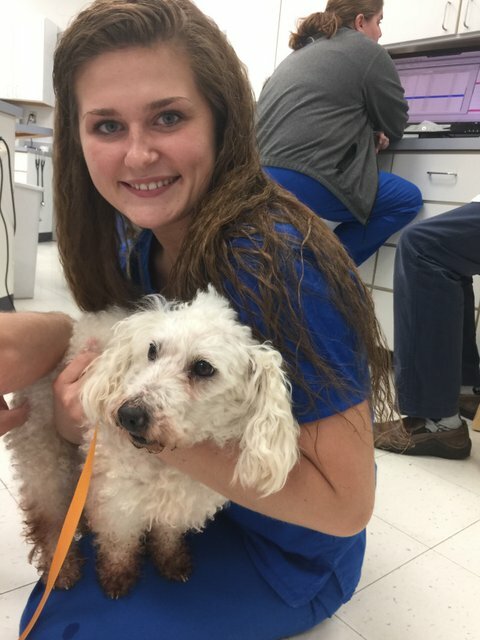 Thanks to the generous donations to our Kylie & Cricket Memorial Fund, Kingsbrook Animal Hospital has been able to help another local Frederick dog in need! 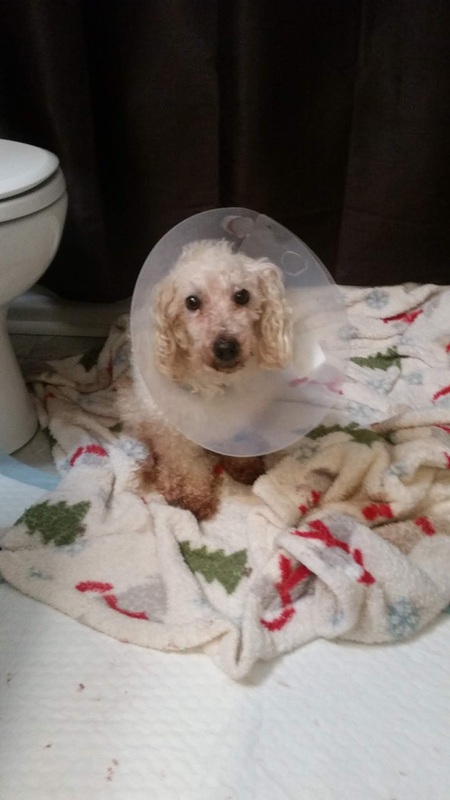 My name is Rose and I am a 10 year old female Poodle! 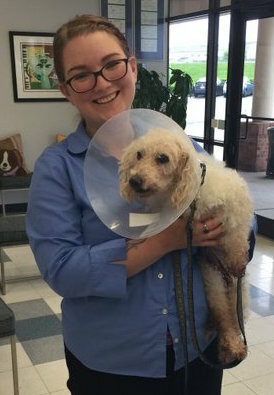 I was found as a stray by a good Samaritan and brought to Frederick County Animal Control. When I was brought in, the folks at animal control found that I was intact and had multiple mammary tumors. They contacted Kingsbrook Animal Hospital to see if there was something that the Kylie & Cricket Memorial Fund could do to help! Luckily, KAH had an opening and were able to get me in the same week! Technician Rush getting my weight for my big day. Technician Rush checking me in for surgery. Dr. Kemper began my physical examination and realized that I was badly in need of an oral evaluation & cleaning. I was afraid to tell anyone, but my mouth REALLY hurt! First, Robin, veterinary technician, and Caitlynn, veterinary assistant, needed to take digital X-rays. Dr. Kemper knew that I had 5 mammary-chain tumors, but he wanted to make sure that there were no other signs of cancer that may have spread within my body. After all, there is a 50/50 chance that mammary tumors could be cancerous! Then, Dr. Kemper looked over my bloodwork results and determined that it was safe for me to go under anesthesia. Robin getting ready to take my picture! Dr. Kemper started with a physical exam. Rush getting my teeth nice and clean. 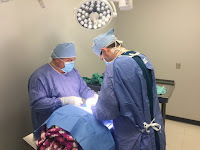 Since my surgery was going to be quite extensive, Dr. Davis kindly stepped in to help. They scrubbed up and got to work on doing my spay first and carefully removing each tumor to send out for biopsy. After my sutures were placed, Rush, surgery technician, began my oral evaluation and cleaning. Rush took digital oral X-rays while Robin monitored and recorded my vitals to be sure I was stable throughout the procedure. It was a good thing we took X-rays because there was a lot going on! 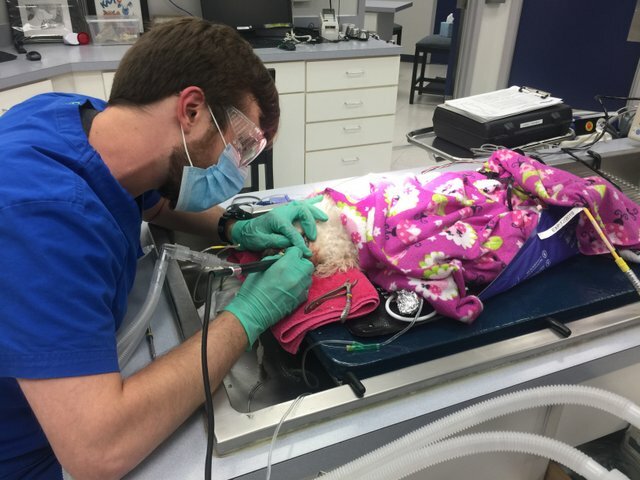 Dr. Kemper and Dr. Davis found multiple missing teeth, bone loss, and recessed gums. By the end of the day, I had a total of 13 teeth extracted! Wowee! Since I had a lot of work done and spent a long time under anesthesia, Lainey, veterinary technician, decided to take me home to keep a close eye on me throughout the night. She even brought me straight to my foster family the next morning! 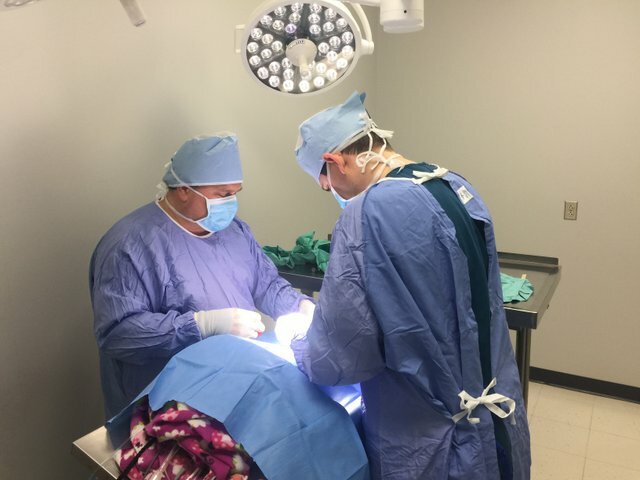 Dr. Davis & Dr. Kemper working to remove multiple tumors. Already feeling so much better the next morning! So far, my recovery has been great! I’ve come back to see Dr. Davis to have my drain removed and my sutures checked for any signs of infection. And my mouth feels great! 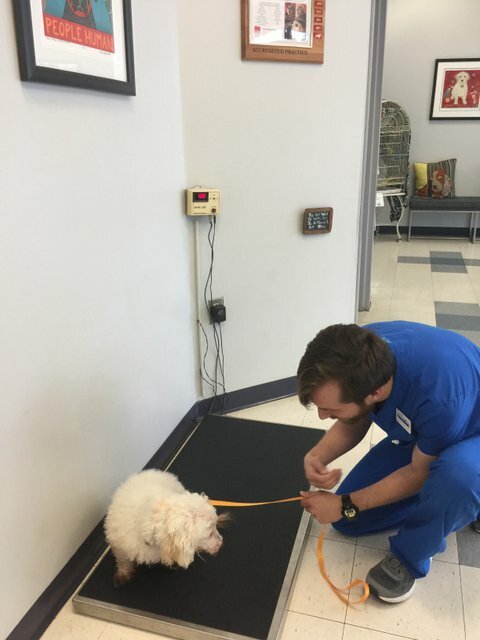 When I came back for my recheck, Aaron, veterinary assistant, took a peek in my mouth and it didn’t hurt at all! I’m a very lucky girl. The good news doesn’t end there, all of my tumor biopsies have come back benign except for one that is abnormal, but Dr. Kemper is very optimistic about the outcome! While I am currently being cared for by my very sweet foster mom, I am still looking for my fur-ever home! So, friends, take a chance on me! I promise to shower you with nothing but unconditional sweetness and love. Not sure? 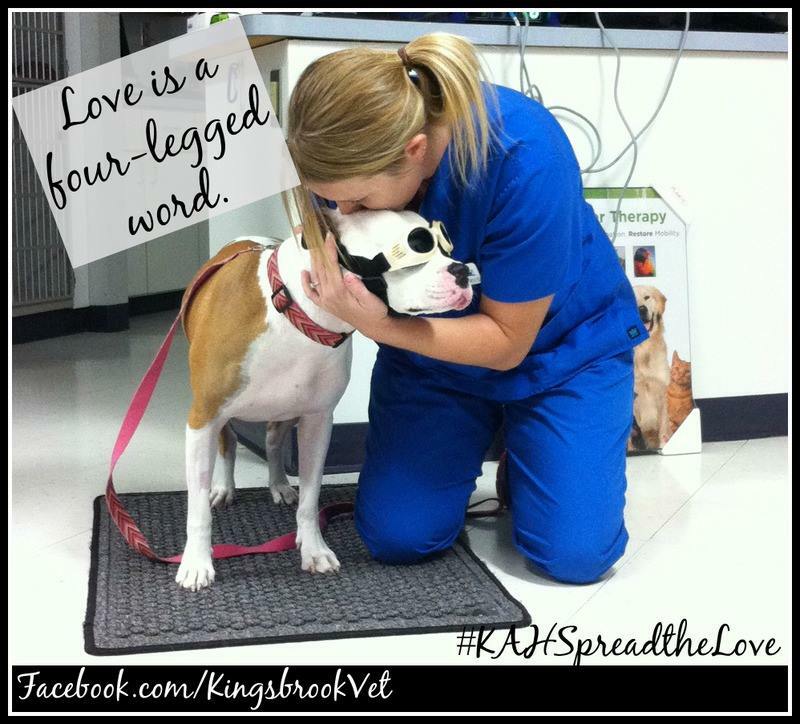 Call and ask any of my new friends at Kingsbrook Animal Hospital, they’ll tell you – I’m a keeper! Me and my friend, Julia. who attended came away with a unique and beautiful piece of artwork featuring a favorite pet. We raised over $270 for the Memorial Fund. Turnout was so good, and everyone had so much fun, that we’re doing it all over again! 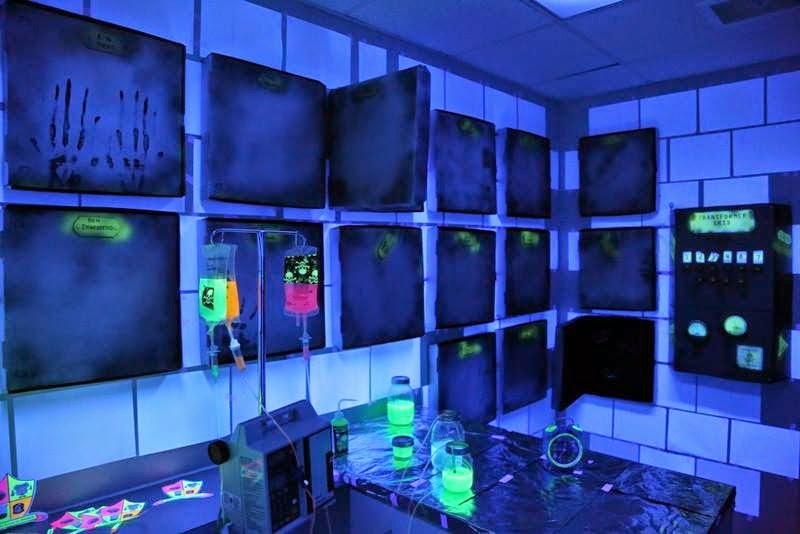 Clients and doctors alike are busy painting! Our next Paint Your Pet Night will be on May 31st, 2017, from 6:00pm- 8:00pm. Tickets are $42.00, and 20% of ticket price goes directly to the Kylie & Cricket Memorial Fund. Since the portrait is painted from a photograph, the desired photograph needs to be submitted via email directly to Hot Fired Arts, no later than May 26th. Their website can be found at https://www.hotfiredarts.com/. This is a BYOB event, so come prepared to have a great time with your favorite Kingsbrook Animal Hospital doctors and staff! It’s that time of year! The holidays are here, and one of the best ways to celebrate is by giving to others. 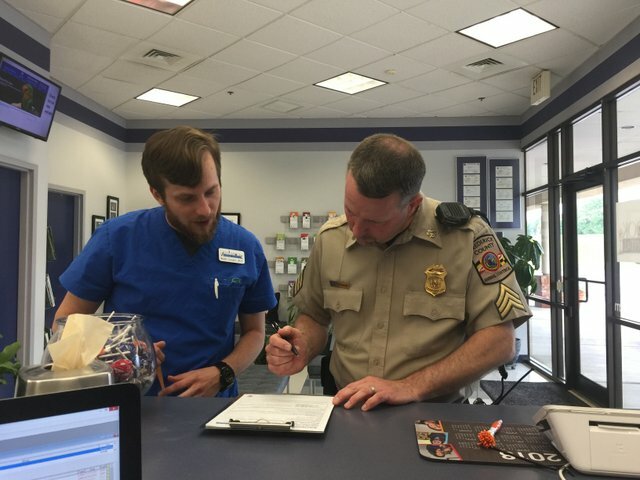 Kingsbrook Animal Hospital, through the Kylie & Cricket Memorial Fund, was able to use the donations from November 12th’s Santa Paws photos to put together a special gift for Frederick County Animal Control! Lots of candy for our FCAC friends! On December 21st, KAH assistant Robin and technician Abby piled into the car with a huge gift-wrapped box of Kong toys, donations of food and blankets, and stockings full of candy for all of the technicians, assistants, doctors, and officers who make up the wonderful team at FCAC. While they were there, Abby and Robin were able to tour the facility and share the new toys with some super-grateful dogs. Now on to the wrapping! FCAC is located at 1831 Rosemont Avenue in Frederick, and within their walls are several wonderful animals waiting for a forever family. 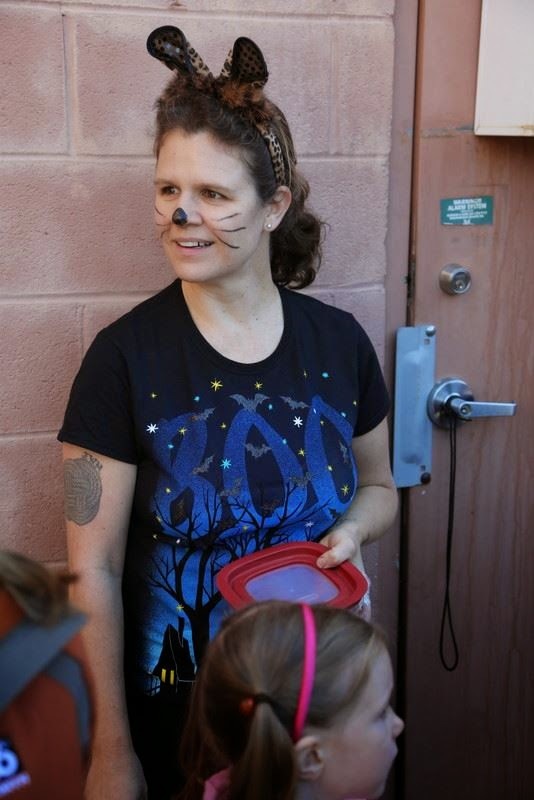 Besides dogs and cats, there are chickens, guinea pigs, chinchillas, and even a hedgehog. 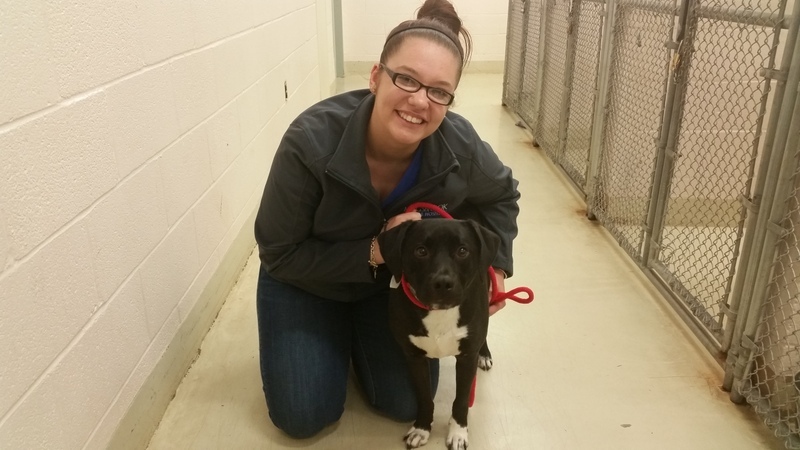 While Abby and Robin were visiting with the staff and taking the tour, two families filed applications for adoption! KAH is so excited to be able to share these gifts with FCAC, and it’s all possible because of the wonderful donations that have been made to the Kylie & Cricket Memorial Fund. 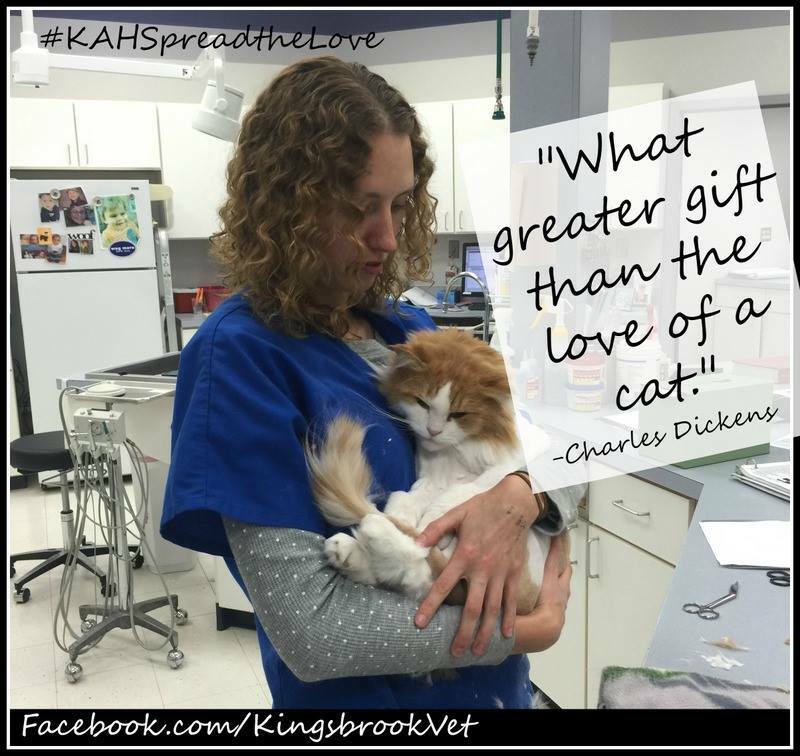 From all of us at Kingsbrook Animal Hospital, have a fantastic 2016 holiday season! 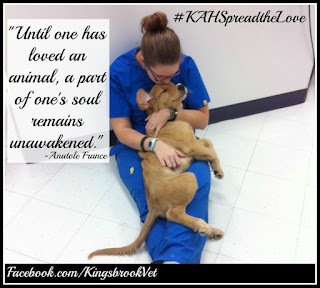 #KAHSpreadtheLoveDrive - Kingsbrook Animal Hospital delivers dog biscuits to Frederick's homeless dogs! During the month of February, we focused on looove and how we spread love every day. 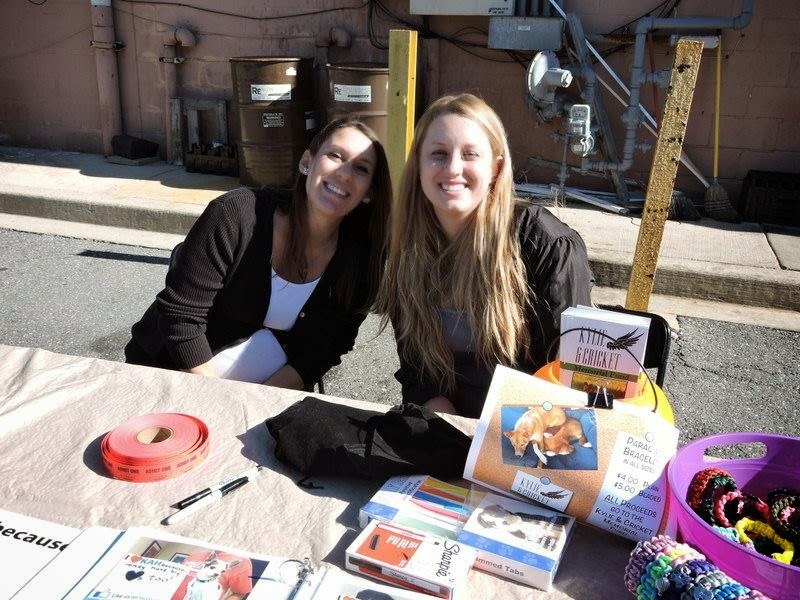 What better way to spread the love then to donate to our local animal shelter, Frederick County Animal Control?! We decided, with the help of the Kylie and Cricket Memorial Fund, to donate homemade dog biscuits made by hand with love by the team at Kingsbrook Animal Hospital. We posted on Facebook three pictures of our techs doing with they love- caring for our patients! For every 'share' the picture received we committed to donating 1 bag of dogs treats! Our amazing fans shared the pictures 251 times! That's a lot of dog treats! 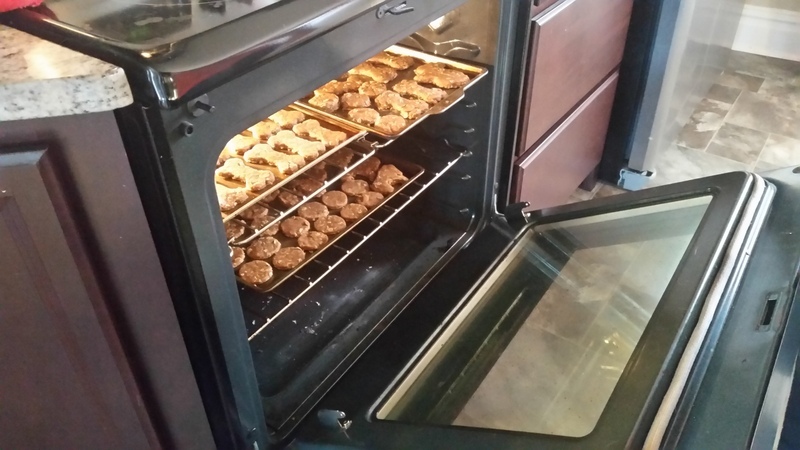 Then, our work really began- KAH Baking Day! Julie cutting out the biscuits! 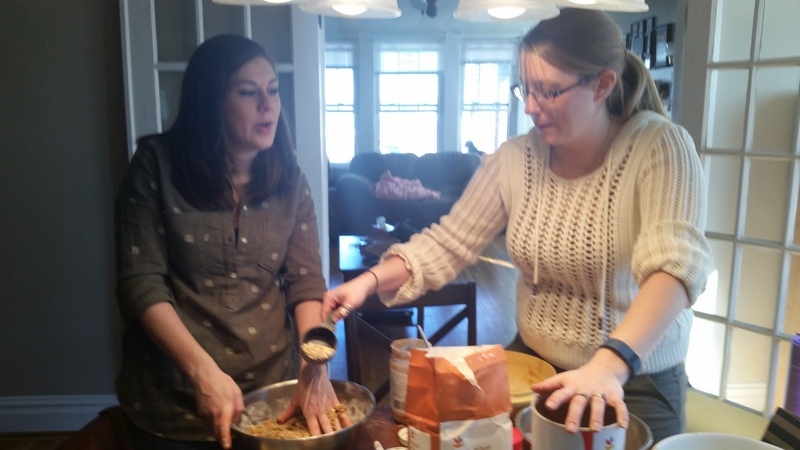 Lainey and Katie mixing the batter! Lots and lots of biscuits in the making! 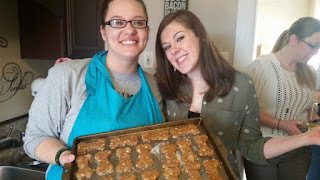 Samantha and Lainey on baking day! 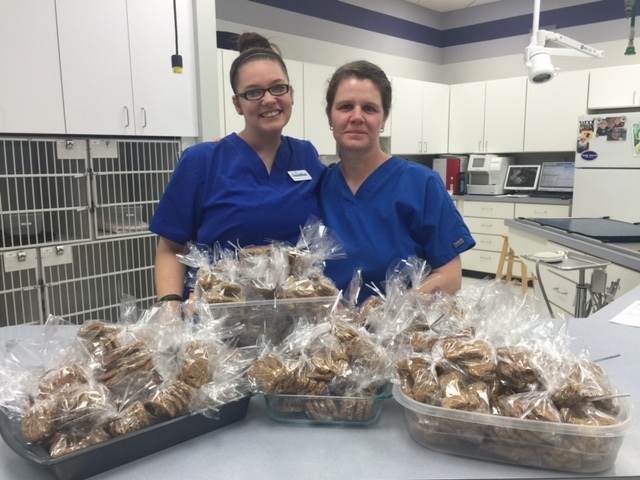 Veterinary technician, Samantha, had the fun job of delivering the dog biscuits on Leap Day. 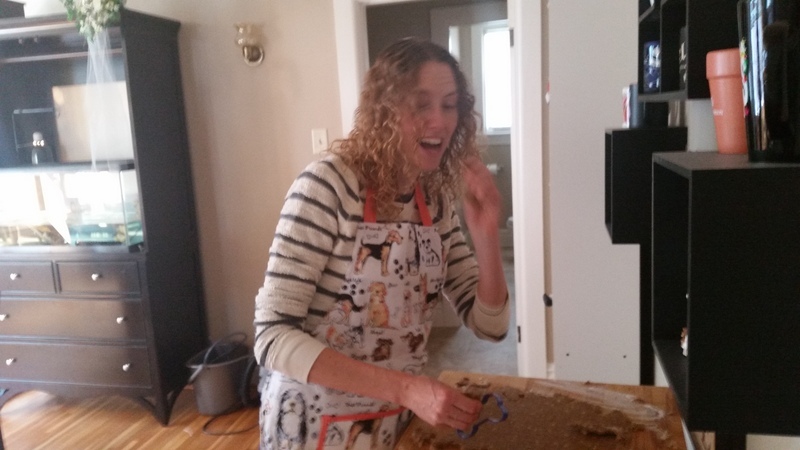 What better way to spend and 'extra' day then sharing homemade dog biscuits with homeless dogs! 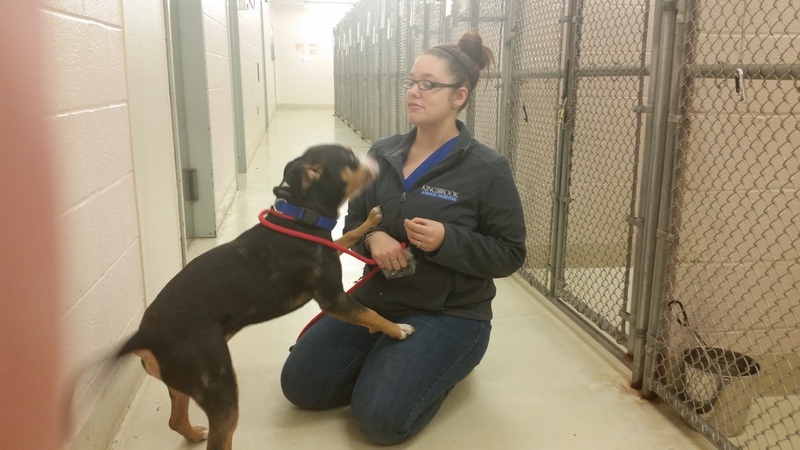 While at FCAC, Samantha met Buckwheat, Rosco, China, and Dierk. Buckwheat is a 3 year old lab mix. He is timid at first, but once you say hello, he is such a sweetheart! He was so gentle when Samanta gave him his cookies and he loved every last bite! China is a 1 year old pit bull mix who is a tiny little thing, but full of energy! She was so excited for attention, she didn't even realize Samantha had dog biscuits! Once she finished her treat, she kept searching for more! 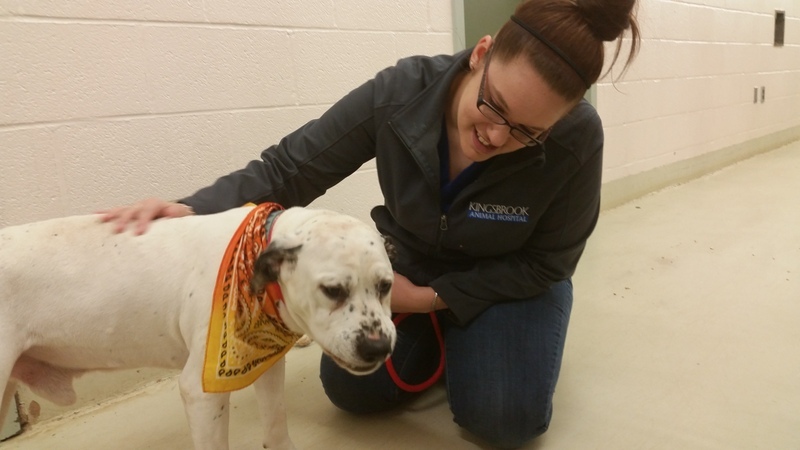 Rosco is a 9 year old dalmation/pit bull mix. He is a very sweet old man, but he didn't let his age stop him from enjoying his dog biscuits! Dierk is a 2 year old pit bull mix. He had watched all the other dogs get their biscuits and knew what was coming! When it was finally his turn, he was so excited he barley chewed them and they were gone in the blink of an eye! He spent another few minutes getting scratches from Samantha before wandering down the aisle, looking for any crumbs that the other dogs may have left behind. We want to thank everyone who tok the time to share our pictures. 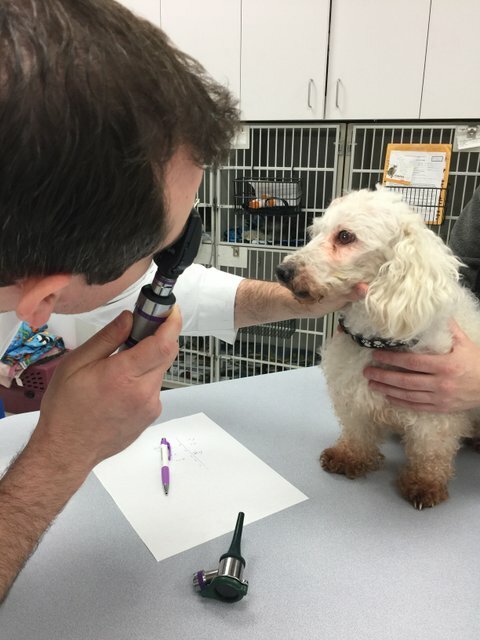 Because of each of you, we were able to treat many homeless dogs in the Frederick area. Keep spreading the love, friends! Click HERE if you want to check out our dog biscuit recipe! Contact Frederick County Animal Control if you are interested in any of the homeless dogs highlighted above. 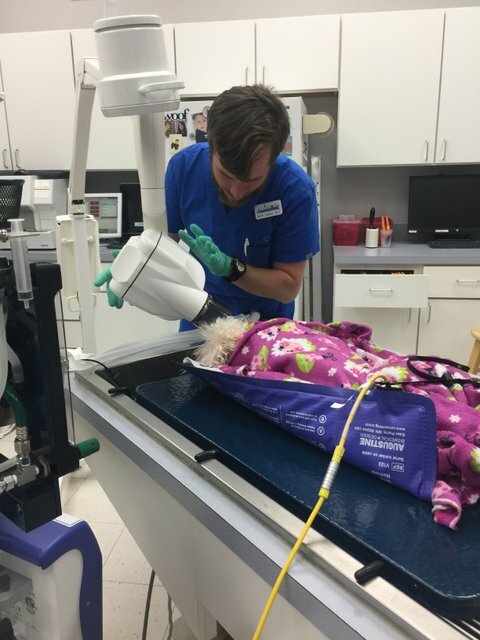 KAH and the Kylie and Cricket Memorial Fund help Phoebe the Chihuahua! Thanks to all the generous donations to the Kylie and Cricket Memorial Fund, we have been able to help another homeless animal! 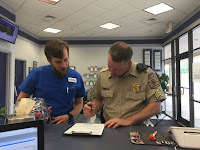 Kingsbrook Animal Hospital contacted Frederick County Animal Control who introduced us to Phoebe. Phoebe is a female Chihuahua that was desperately in need of a dental cleaning, digital dental x-rays, and extractions. She is around 5-6 years of age and is a very sweet girl who is still in search for her forever home. Dr. Davis began with a physical examination. During Phoebe's exam, it was obvious that her mouth was very painful. Even though it was uncomfortable, this sweet girl wanted nothing more than to be held and loved. 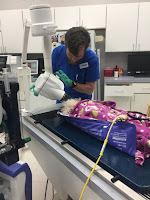 During her dental cleaning, Dr Davis ordered digital dental x-rays to be taken. This showed us that under Pheobe’s gum the roots of some of her teeth were deteriorating! The best option for Pheobe was to extract the affected teeth. In fact, Dr. Davis extracted 9 teeth in total! Pheobe’s remaining teeth were hand and ultrasonically scaled and polished, and fluoride was also applied. 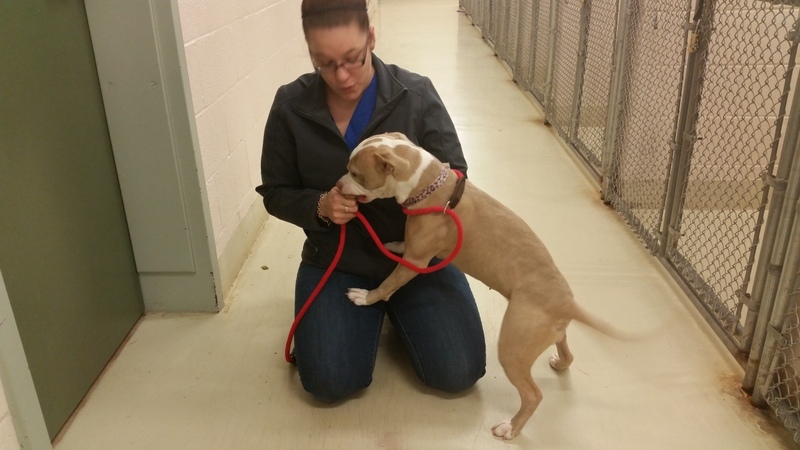 Pheobe is now back at FCAC in Frederick, MD and waiting to find her forever home. Your generous support not only makes her a better candidate for adoption, but also has her feeling better! Thank you again for supporting the Kylie and Cricket Memorial Fund! 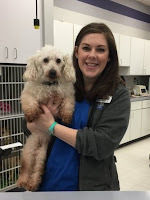 Santa Paws visits Frederick, Maryland and Kingsbrook Animal Hospital! Santa Pictures were a huge success this year thanks to our awesome clients and friends! We raised over $ 1,200 for our Kylie and Cricket Memorial Fund! Santa Paws (aka our veterinarian, Dr. Davis) and his elves arrived in Frederick, Maryland just in time to take pictures with all of our fury & not so fury friends! 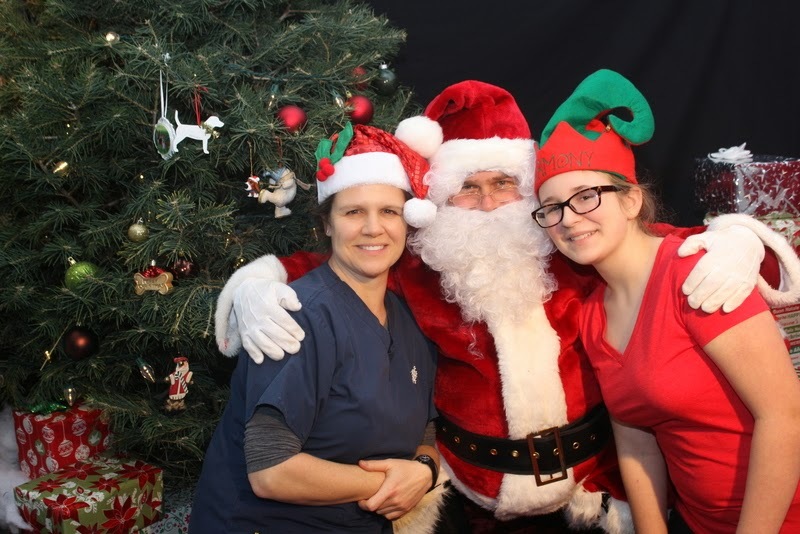 Kingsbrook Animal Hospital was filled with Christmas cheer, hot chocolate and even a few kids crafts. Our packages this year included favorites gift tags, direct email, and prints to enjoy. New this year was the option of ordering holiday cards! Samantha, our technician AND photographer! "I'm ready for my picture!" 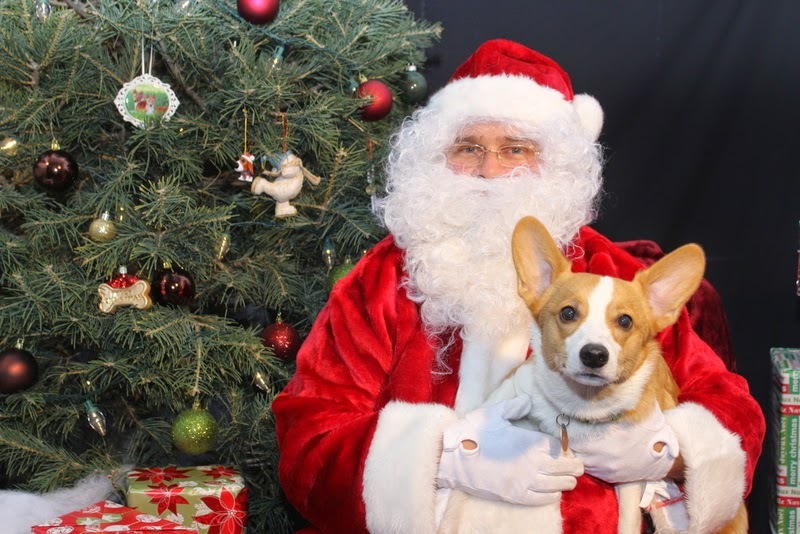 We can’t wait until Santa Paws visits again next year! 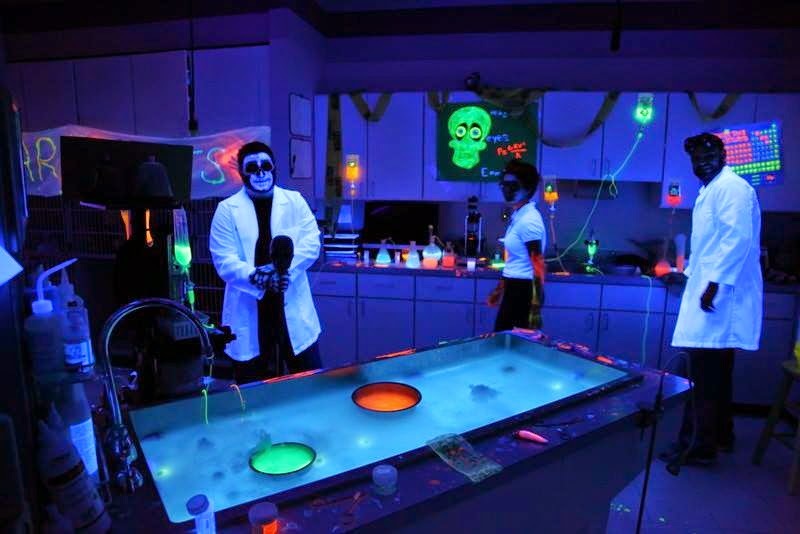 Kingsbrook Animal Hospital hosts 2nd Annual Haunted Hospital!! 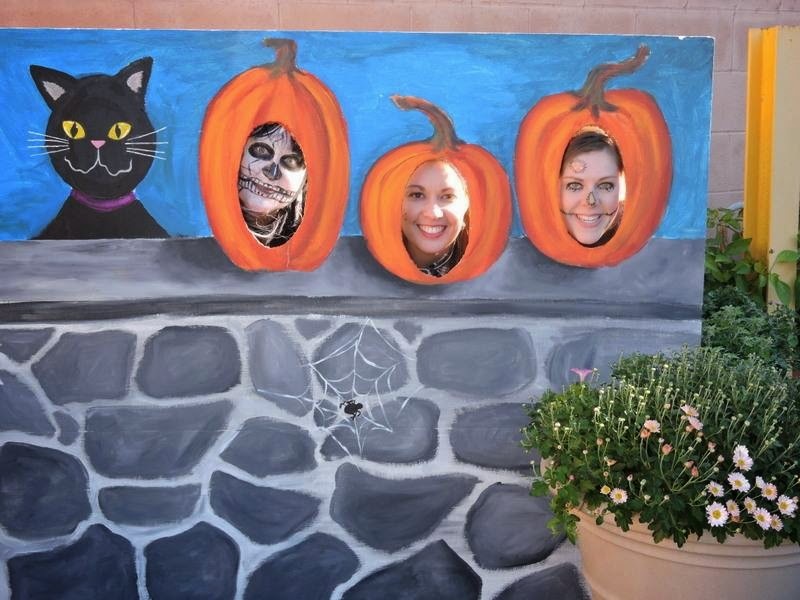 Thank you to all- both spectators and vendors- who made the KAH second annual Haunted Hospital such a huge success!! Ranee, Dr. Walker, and Lainey having fun! We had 9 different vendors come to speak with the public, as well as KEY 103 who broadcasted from our parking lot. Our "trunk-n-treat" cars provided kids with lots of Halloween goodies and our trio of games made for some entertainment while waiting for the Hospital tour!! Throughout everything, our main objectives were to put on an awesome performance for all of you and to raise money for the Kylie and Cricket Memorial Fund. We raffled off two gift certificates- one to Two Paws Up and one to Hot Fired Arts- congratulations to the winners!!! 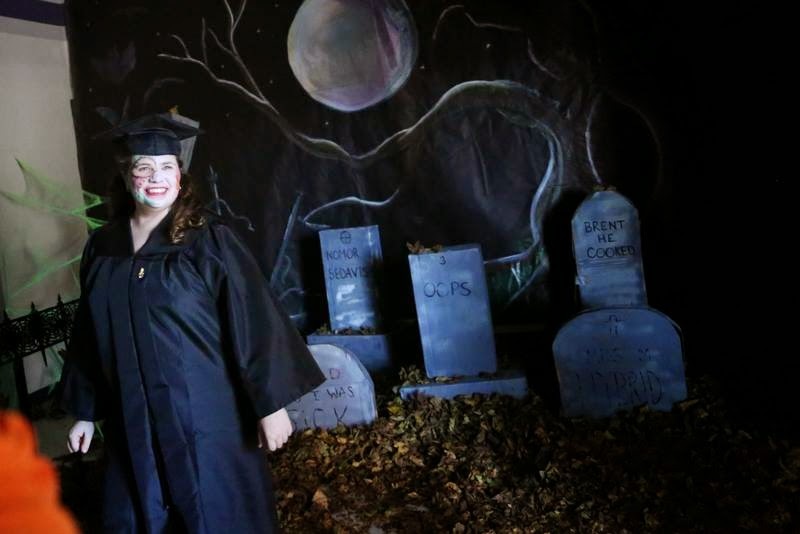 The grave yard was "thrilling"! We were so fortunate to have so many people donate to this cause and we were able to raise over $800 to help local Frederick, Maryland animals who have not yet found their forever homes. Check out our Facebook page to view all of our pictures and our YouTube page to see the video!